Rough edge tumbled Italian marble. Cracks and visible distressed markings add character and authenticity, making each piece unique. 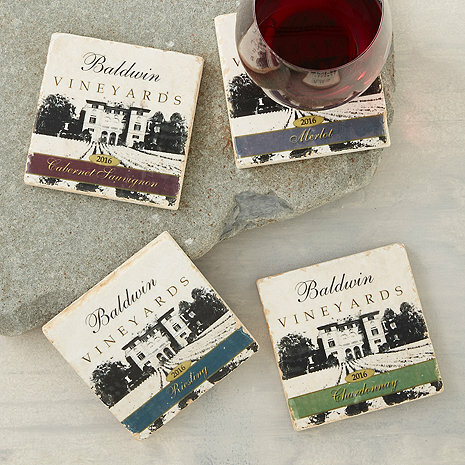 Comes in 4 varietals; Chardonnay, Cabernet, Merlot and Riesling, each personalized with family name or message. Secure cork backing to protect your surfaces. Please note "VINEYARDS" & the varietal name ARE automatically included in the print. The marble coasters are very rustic, but still elegant. I am very pleased with the purchase.